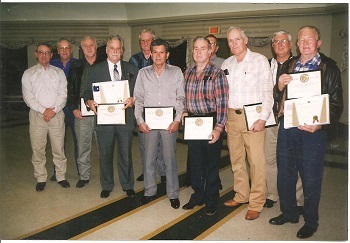 The main objective of the club is to carry out the spirit of the Brotherhood by coming together as a group for visitation, to enjoy the social occasion of sharing a great meal and to benefit in the camaraderie of people who share past experiences from their trade and common goal of passing on their knowledge to the next generation. The Officers of this Club are as follows: President, Vice President, Recording Secretary, Treasurer, Sergeant at Arms and Executive Board. Officers serve a 3-year term. Taken from the Bylaws, "The purpose of this Club shall be to carry out the spirit of the Brotherhood, to aid and assist each other as necessary, and to promote the Social, Economic, Health and Political Welfare of its members." The Club assesses no dues from its members. Meetings of this Club are held the second Thursday of the months of September through May at 12:00 noon. After a short business meeting, lunch is served, followed by 10 games of bingo. Current location for these meetings is at the Plumbers and Pipefitters Local Union No, 142 Apprenticeship Building, 3630 Belgium Lane, San Antonio, Texas. The Club takes a summer break from June through August. Lunches served at the meetings are generally a covered dish furnished by the members. The Club asks of its members to bring a main dish, side dish or dessert. The menu for the lunches is planned in advance so the members will have time to plan. There is four times a year the Club furnishes the meal, food will be ordered and delivered or picked up by a member. A charitable project for the holiday season is selected each year and for the past three years our choice has been The Wounded Warriors. Donated items are collected beginning in October and delivered in December after our meeting. The Club is self supporting, one main fundraiser is a golf tournament held in the month of April. At times, other fundraisers may be held when voted by the the members. The month of May will be the last month the Club meets before the summer break. This month is generally the "Years of Service" pin presentation to the members receiving one. In May of 2015, Club members had the honor of witnessing John Weber receive his 75 year of service pin. "Get Well" cards are semt to members who need an encouraging message while facing health issues and "Sympathy" cards are mailed to families facing the loss of their loved ones as we face the loss of one of our own. In addition, a $20 memoral donation is made to the I.B.E.W Local Union No. 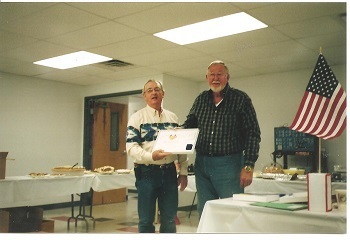 60 Wireman's Association to honor the passing of either a Retired or Active Member. BROTHERHOOD is defined as "as association, society or community of people linked by a common interest, religion or trade."